Air-filled cavities located within specific facial and skull bones are known as paranasal sinuses . 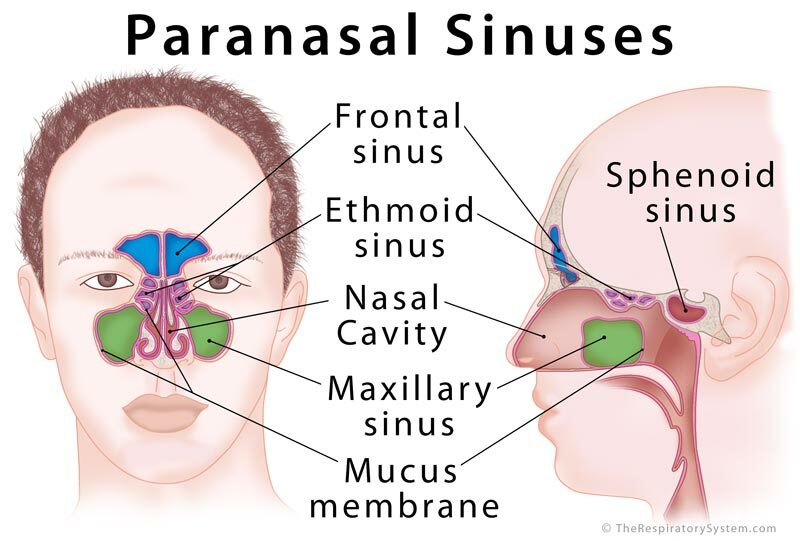 Humans have four paired paranasal sinuses, frontal, maxillary, sphenoid, and ethmoid, all extending from the respiratory area of the nasal cavity , and named after the bones they are found in. Frontal Sinus (within the frontal bones): Starting from the lower middle part of the forehead, these two sinuses reach over the eyes and eyebrows . Maxillary Sinus (within the maxillary bones): The largest among all the paranasal sinuses , these two conical cavities are located on the two sides of the nose, above the upper teeth, and below the cheeks . 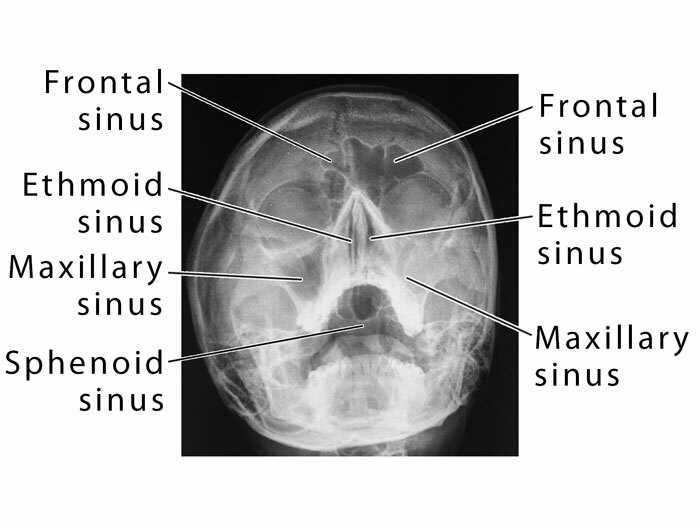 Ethmoid Sinus (within the ethmoid bones): Three to eighteen  air cells present in the ethmoid labyrinth, on both sides of the nose, between the eyes [6, 7]. One side of the nose may have a higher number of air cells than the other. Sphenoid Sinus (within the sphenoid bones): The most posterior of all the paranasal sinuses, these are located behind the ethmoid sinuses, near the pituitary gland and optic nerves . The nasal septum separates the left and right maxillary sinuses . The maxillary and ethmoid sinuses are present at birth, starting to form around the 3rd or 4th month of gestational development . They further develop over the first few years of life . Rudimentary sphenoid sinuses are there at birth, forming (pneumatizing) completely by the age of 5 years . The frontal sinuses are the last to appear, around 7-8 years of age, with the pneumatization being complete only after the individual reaches late adolescence [8, 10]. Due to this, the shape and size of the sinuses usually vary from person to person in adulthood . 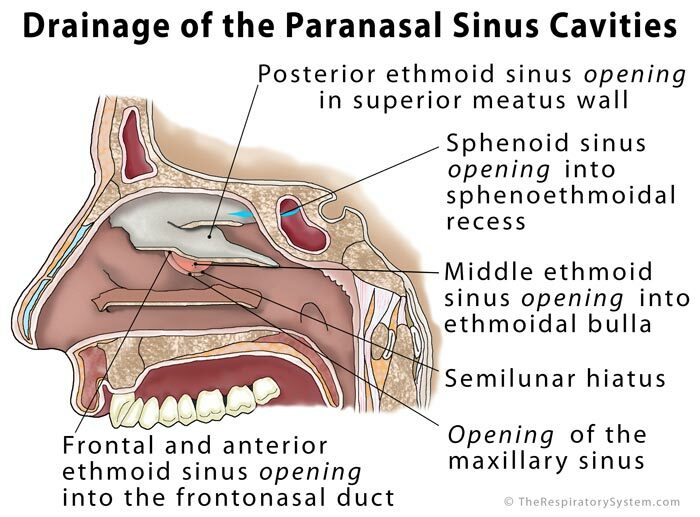 The two frontal sinuses drain through the frontonasal duct, which opens in the lateral wall of the nasal cavity, at the semilunar hiatus . Their drainage path may vary depending on how the frontal sinus drainage pathway (FSDP) develops . 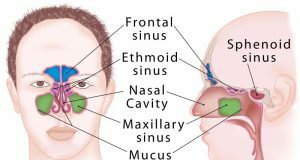 The maxillary sinuses also open out at the semilunar hiatus, just below the frontal sinuses, to drain into the nasal cavity [2, 14]. According to their location, the two pairs of anterior, and middle ethmoid sinuses drain into the middle nasal meatus (the semilunar hiatus and the ethmoid bulla respectively) , while the posterior ethmoid sinus drains into the superior meatus . The sphenoid sinuses drain into the sphenoethmoidal recess just above the superior concha  in the upper back wall of the nasal cavity. Like the nasal cavity walls, all the sinuses have mucus , and cilia (tiny hair-like structures) covering their inner surfaces. The mucus produced within them is continually swept into the nasal cavity by the cilia . Their purpose is not yet clearly known; however, being extensions of the nasal cavity, helping with cleaning and humidification of air during breathing is believed to be one of their main functions . The mucus lining of the sinuses helps in purifying the air, as all dust and other harmful particles stick to the mucus, to be brushed out of the body through the nasal cavity . Sinusitis: As the sinuses directly continue from the nasal cavity, infections of the upper respiratory tract, such as the flu, or rhinitis, can easily spread into the sinus cavities, leading to a condition called sinusitis . Characteristic symptoms include a sinus headache, facial pain or tenderness, and feeling of a stuffy nose . Most commonly affecting the maxillary sinuses , inflammation or infection in this area may cause pain in the maxillary teeth as both are innervated by the maxillary nerve . Any blockage in a sinus passage may cause mucus to accumulate, also leading to bacterial or viral infections .